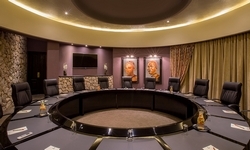 For the corporate market Thaba Eco Hotel offers conferencing facilities that range from executive boardrooms to banqueting halls, accommodating groups from 5 to 500 delegates. Our close proximity to Johannesburg and the tranquil bushveld surroundings make us ideal for conferences, strategic planning, team building, workshops, training, product launches and year end functions. Delegates can relax and unwind in luxury rooms amidst the tranquil setting with breathtaking sunsets, a fully equipped spa, refreshing pool and meditation nature trail that will revive a tired mind to ensure optimal creativity.